Ramadan Abedi’s praise for extremist groups suggests a potential link between a previous generation of fighters and the current wave of jihadis bombing civilian targets in Europe and the Middle East. Ramadan Abedi, the father of Salman Abedi, spoke to media in Tripoli on Wednesday. 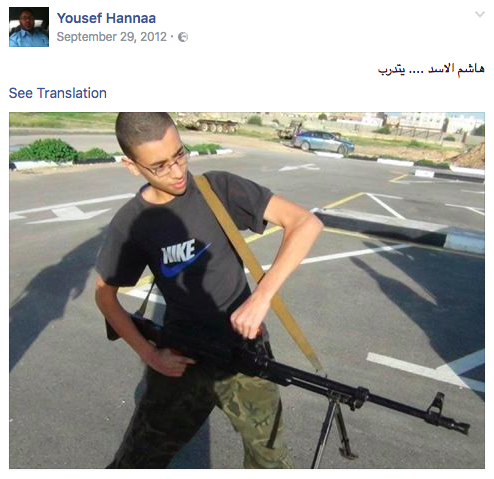 ISTANBUL — The father of Manchester suicide bomber Salman Abedi praised Libyan and Syrian militant groups, including al-Qaeda affiliates, in his social media posts, boasting that his youngest son, Hashem, now arrested as a suspected ISIS militant, was “training” alongside a picture that shows a young man holding a mounted machine gun. The elder Abedi, now in the custody of a powerful UN-affiliated militia in the Libyan capital, Tripoli, according to reports in the British media, was a veteran of the Libyan Islamic Fighting Group (LIFG), a militant organization that fought the Soviets alongside Osama bin Laden in Afghanistan in the 1980s and later staged operations against the late Libyan dictator Muammar al-Qaddafi. In an interview with Reuters earlier this week before his arrest, he insisted he was not a current member of the LIFG but supported the group. “I am not part of the Libyan Islamic Fighting Group but I commend them,” he said in a video interview. 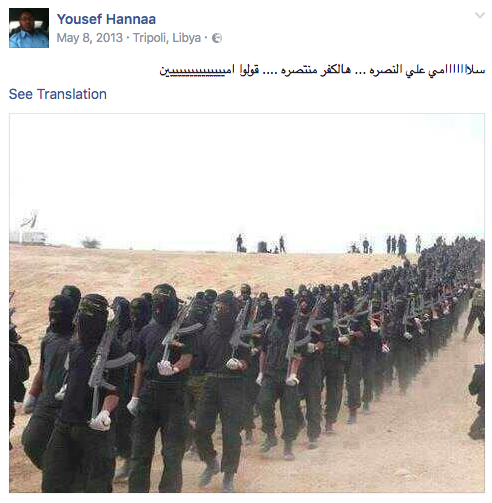 The Facebook page’s public posts, last updated four years ago, are under the alias Youssef Hanna. The page was identified as belonging to the elder Abedi by Libyan social media users who matched the profile photograph and other identifying features. Posts on the page show his ties to Manchester and his employment by Tripoli’s Central Security Directorate, a militia under the control of the Islamist-leaning authority controlling the capital and allied with the UN-backed government. Most LIFG members and their supporters spent years in prison or exile, eventually emerging as aging, paunchy politicians within fractured and warring post-Qaddafi Libya. But Ramadan Abedi’s praise for current-day militant groups, including the extremist Libyan Revolutionaries Operations Room, suggests a potential link — of family ties and ideology — between a previous generation of fighters who fought in Afghanistan and against secular Arab regimes in the 1980s and 1990s and the current wave of militants bombing civilian targets in Europe and the Middle East. The Abedi family’s trajectory may also boost the arguments of Middle East strongmen like Egyptian President Abdel-Fattah el-Sisi and Libyan commander Khalifa Haftar, who insist moderate Islamist groups like the Muslim Brotherhood, mostly engaged in electoral politics, are part of the same spectrum as ISIS and al-Qaeda. The Special Deterrence Force, a Libyan militia that has emerged as the most powerful security formation in Tripoli, arrested Abedi at or near his central Tripoli home after he gave a television interview absolving his son of guilt in the Manchester attack. He said he had spoken to his son several days before the attack. “He didn’t say he was going to Manchester,” he said. The Special Deterrence Force is currently holding both Ramadan and UK-born Hashem, 20, who they claimed had been under surveillance for suspected ISIS ties for about 45 days and was allegedly “planning to carry out a terrorist act inside the capital Tripoli” before he was arrested Tuesday night, according to a statement by the force. A spokesman for the Special Deterrence Force told BuzzFeed News interrogations of both suspects were ongoing. Salman Abedi's mother and two sisters, both in Tripoli, were also summoned by the investigators for questioning on Thursday at the force's headquarters in Tripoli's Mitiga Airport but allowed to return home afterward, the spokesman for the force said. ISIS staked outposts in Libya in the chaotic aftermath of Qaddafi’s 2011 downfall at the hands of rebels backed by NATO airstrikes. After ignoring the group for months, Islamist-leaning militias like the Special Deterrence Forces began taking on ISIS when it began to launch attacks on Tripoli. A correspondent in Tripoli, Libya, contributed to this report.